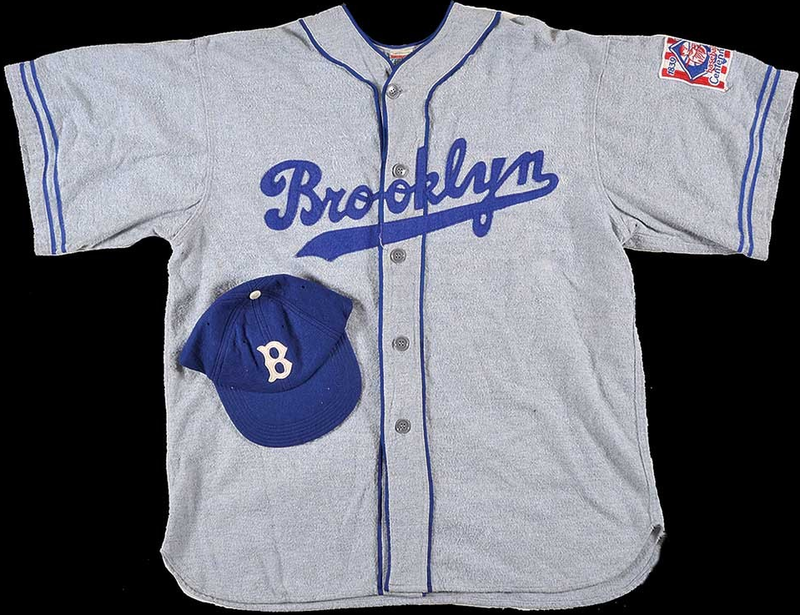 Brooklyn Memorabilia at REA - Dodger Stock, an Old Pin and a Jersey from "The Natural"
Yesterday I wrote about a vintage letter from an old Brooklyn coach to one of his top players (check that out here) that is available at REA's current auction. 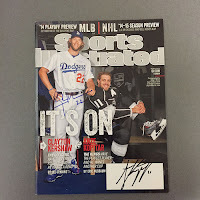 Now, I wanted to point out a few more Dodgers related collectibles that struck my fancy. Above is an old Brooklyn Dodger uniform. (Auction link here) It is a reproduction that was created for the Robert Redford movie "The Natural". As you can see, it is meant to represent the jersey's worn in 1939, as evidenced by the Baseball Centennial patch on the left shoulder, and sports the iconic number "42". 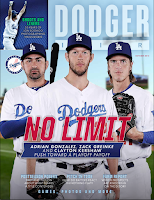 It was obviously created in homage to the great Dodger barrier breaker - Jackie Robinson. 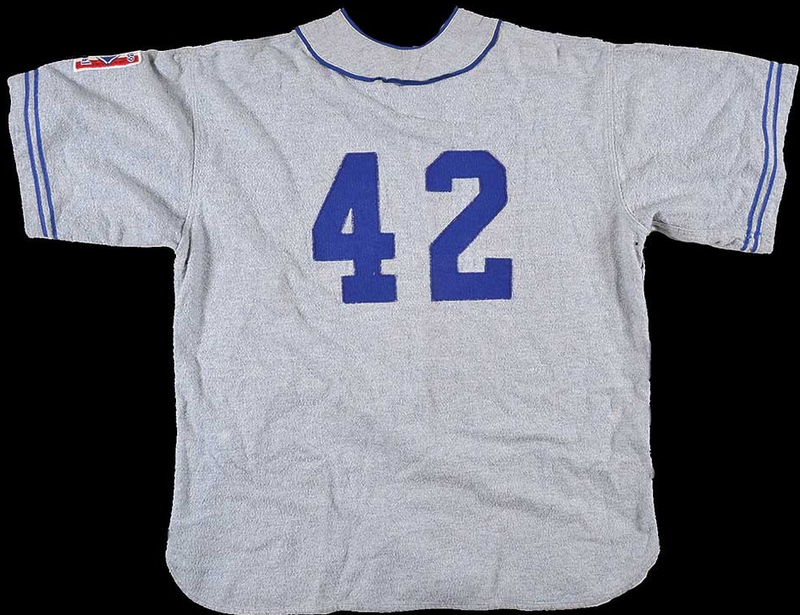 The listing claims that it was worn in the movie, but I don't actually recall seeing a Dodger uniform in it. If you know differently please pass that along. BTW, a similar jersey sold last year at Lelands Auctions at $388.00. I do not know if the above example is the same item. Everytime I see the item above for sale I get exciting. For a fleeting moment I imagine myself emptying out my bank account to add it to my collection. 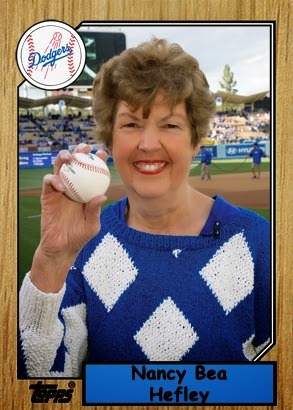 Then, I'd try to claim partial ownership of the team to fulfill a lifelong fantasy. Of course, it would be stupid for me to do that; especially since these documents have long since been cancelled. Still, it would be cool to have. 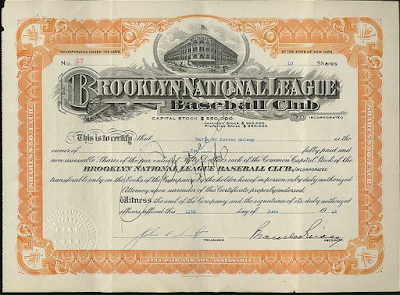 Featured above is a 1948 Brooklyn Dodgers stock certificate. 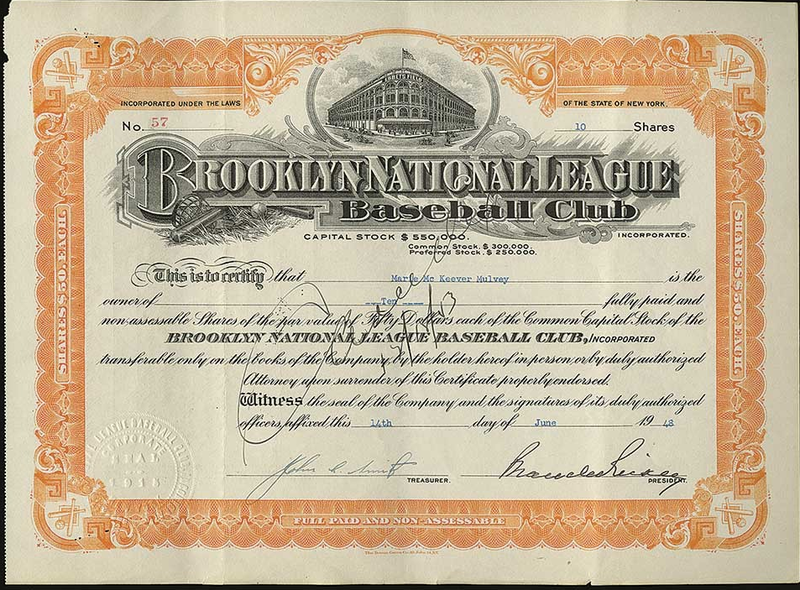 It has been signed by then President Branch Rickey, team treasurer John Smith and former owner Marie McKeever Mulvey. BTW, Marie remained an owner of the club until 1975. Having featured this kind of certificate numerous times before, I know that an example just like this routinely sells for about $4,500 to $5000 a piece. That's quite an expensive piece of paper. This last item is a pin you just don't see very often. It is a large-format composite pinback celebrating the 1947 National League pennant winning Brooklyn Dodgers. They were originally sold only during the ensuing World Series played that October against the Yankees. 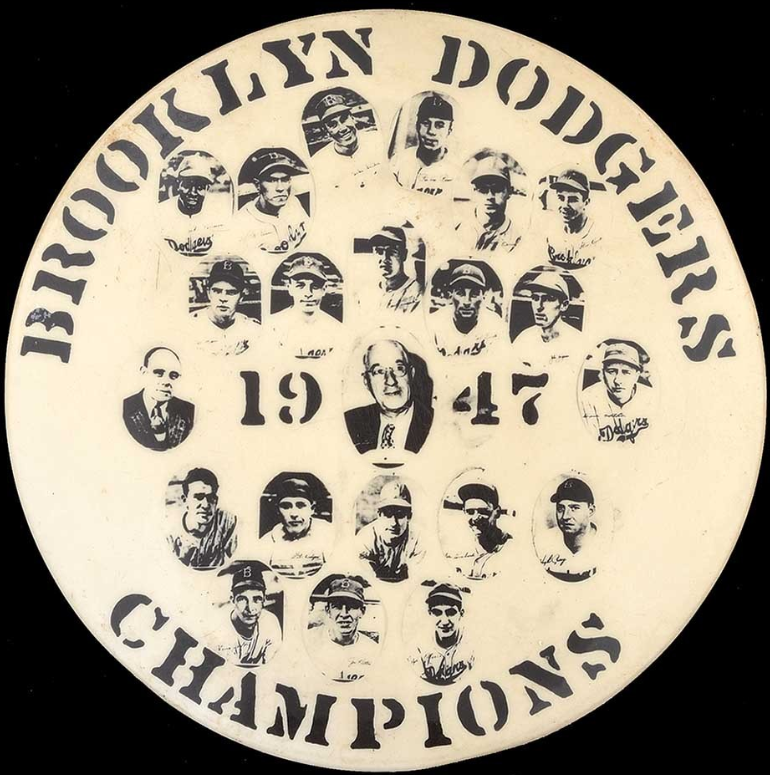 There are 22 faces on the pin; including Jackie Robinson. Considering this was Jackie's first year as a Dodger makes this a unique and extremely desirable collectible. I am uncertain how much an an example like this is expected to sell for, but I imagine it would be in the low four figures. Andre Etheir looks like he was having a fun time hanging out with part of the cast from the show Fuller House, via a pic from David Vassegh on twitter. It's a bit worrisome those ladies were sporting those colors, though. 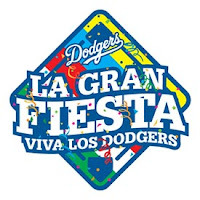 Couldn't they find them some Dodger Blue to wear? It's even more disconcerting that Ethier is wearing a hat reminiscent of that crazy preacher guy in Poltergeist II. That character was creepy. 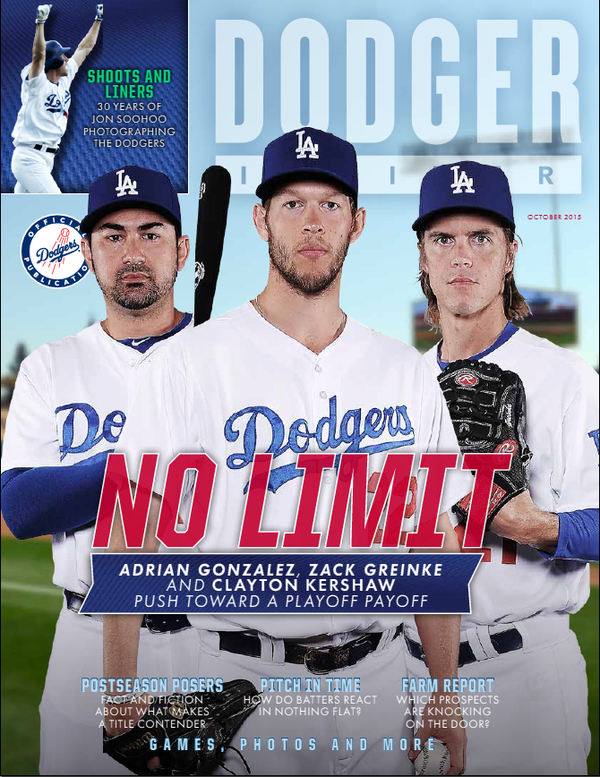 Check out a copy of the October issue of Dodger Insider magazine on the right. Jon Weisman writes a bit about it here. Via Jim Caple at ESPNW, "Will Kim Ng be MLB's first female GM?" I totally missed this from Wednesday's game. Apparently, Austin Barnes achieved the rare feat of hitting a single pitch twice... Twice! Ben Cosman at Cut4 has a gif of it. Check it out. Yasiel Puig might just be ready to play in the NLDS. Via Ken Gurnick at MLB.com, "Puig makes 'miraculous' progress." "Three days ago, he was running 80 percent and having pain," said Mattingly. "All of a sudden it's 100 percent and he feels fine. That's a nice surprise. It's been pretty miraculous, really, for me. Eighty percent to 100 percent. That's legendary." AJ Ellis explains how he got his swing back, via Mark Saxon at ESPN. The breakthrough involved Ellis’ left hand. Rather than break his wrist during his swing, which tended to force him to “roll over” on pitches and hit harmless ground balls to the left side of the infield, he was hitting the ball with greater loft and driving balls to the outfield. He decided he would keep all his focus on keeping his left hand firm. 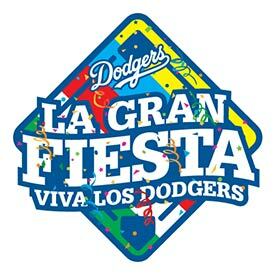 A big thanks to Jon Weisman at Dodger Insider for letting everyone know about the current LA Dodger Foundation auction currently ongoing. Go here to check that out. There's a bunch of great items for sale; including game uniforms, signed balls, bats, locker tags and autographs. My favorite item is the signed Sports Illustrated magazine with Kershaw and Kings centerman Anze Kopitar on the cover. Check it out on the right. Awesome! Night Owl Cards once again writes a fantastic post - this time celebrating Don Newcombe's 1956 Topps card while also tackling the recent "foreigners" comment made by Bud Norris at the same time. He does this by weaving in the integration of Baseball, the rise of the Latin American ballplayer and Newcombe's future role as an alcoholism counselor. It's really a great read, so be sure to check it out. Heck, I think he brilliantly ties them all together in the most perfect of ways. Thanks for writing this Night Owl! So this is what pitching a full season feels like.